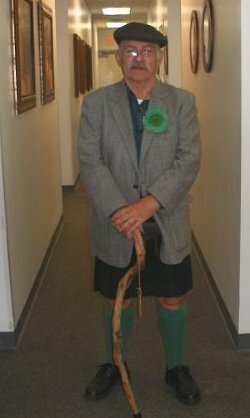 A year ago on St. Patrick's (Irish: Lá Fhéile Pádraig) day I wore this get up to my yearly visits to the VA. It was a hit. 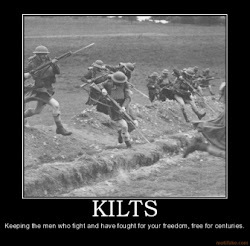 I know that Kilts are not Irish but the peasantry does not so it seemed appropriate. It was a hit with the staff but the other veterans did not know what to do. I was in and out so fast that they were still looking at their feet when I left. Except for the vet crossing the parking lot who stumbled over his own jaw there were no fatalities or injuries. The staff, both mail and female, reacted with enthusiasm and we "passed a good time". Most of the vets seemed to be of Vietnam vintage, are conservative and it is my impression that they think anything in a skirt should be given two dolla' and taken to the back room for three minutes of pleasure. No one made any offers. I know it was not the big mustache that put them off because I've seen them bigger than mine on some select ladies in this area. This year I went naked for my check up, that is without kilt. It wasn't near as much fun. 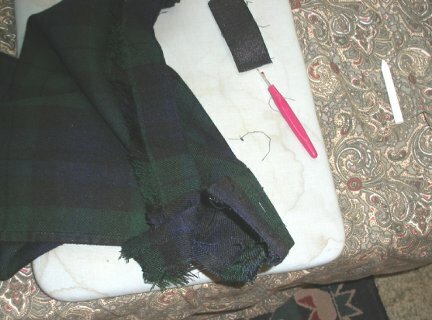 The Black Watch kilt in the photo is a very inexpensive mail order acrilic (fake wool) of very light weight with knife pleats. I buy them for cheap from Stillwater Kilts then sew down the pleats, taper the waist if necessary and hem them to fit my height. This one has had an added pocket under the front apron as seen in this post in April of 2011. Nothing ever fits me off the rack. If you outgrow your clothes when you gain weight do you ingrow your clothes when you lose weight? If so then that is what happened here. It fit fine when I wore it to the VA but I tried it on a few days ago and could not wear it. There is a little leeway with kilts but I had lost girth that was outside the envelope. I took care of that over the last two days. 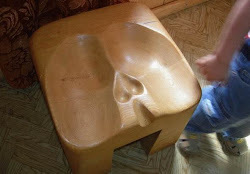 Here it is on my makeshift work table which is my settee. This doesn't look like much but it was quite a job. It takes longer to take it apart than to put it back together. I have a whole new appreciation for re-tailoring clothes. I took six inches or so out of the waist and now it fits perfect. I have another that needs attention but it is a reverse kingussie and I sure do dread it. It is symmetrical so it is going to require removing material from both sides which will require a bigger tear down. When I made it I did so with an eye to the future because I was and still am determined to get rid of the beer gut. It is still going to require a major tear down but the advantages to making your own clothes is "if you made it you can fix it". Someday when I have it on I will try to get a photo. It looks feels and smell like a kilt so I guess it is one unless I run into the kilt police. Daylight Saving Time: Only the government would believe that you could cut a foot off the top of a blanket, sew it to the bottom, and have a longer blanket.